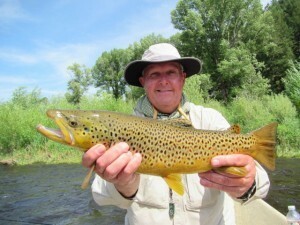 We were very fortunate to spend the last couple of weeks of June fly fishing in Colorado. 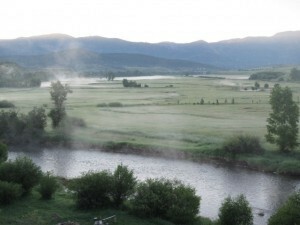 The first part of the trip was spent in the Yampa Valley south of Steamboat Springs, Colorado. Many thanks are due to Captain Jamie Rouse of Rouse Fly Fishing in Heber Springs, AR, and Ryan Herbert of Yampa Valley Anglers in Yampa, Colorado, for hosting a wonderful week of fly fishing. Our headquarters was the Eagle Rock Ranch, a great pace of a Labrador Retriever to play, just outside of Yampa, Co, which has eight lakes on the property that are just full of fat and sassy Rainbows and Brown Trout. Somehow shooting fish in a barrel is just not Bo’s thing. Anyway, it is beautiful ranch with comfortable accommodations and Ryan’s beautiful wife is a marvelous chef. 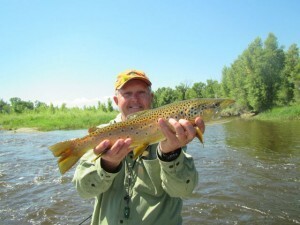 The Yampa River starts at 12,000 feet up in the Flat Tops of the Rocky Moutains in the Routt National Forest and flows north through Steamboat Springs and there is trout fishing for probably fifty miles and we floated it all! The river is probably wadeable eight months out of the year; but flows are only high enough to float for four, or five, weeks per year. Under Colorado law you can float through private water but you cannot anchor or stop and wade. Because most of the river flows through private property the fish do not get a lot of pressure so if you can catch the river on floatable water like we did it is amazing! We caught some real stud fish using a big Stonefly as an indicator with a Girdle Bug, Gold Ribbed Hares Ear and Pheasant Tail making up a three fly dropper. 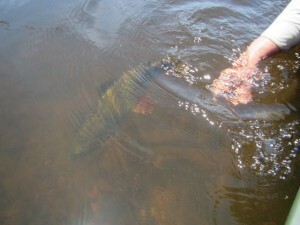 We took fish on all four flys including the dry Stonefly. However, for Bo the real fun was hitting the soft pocket water and back eddies with a streamer on a 6wt. rod with a 250 grain sink tip fly line. The Chuck’s Chunk, McGinnes Extra Stout and Bo’s ACC Streamer were absolutely deadly all week. 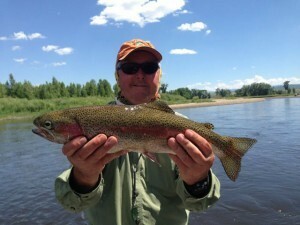 The Yampa is really a hidden jewel and if you want to check it out just get in touch with Ryan as he has multiple waters to fish in addition to the Yampa. 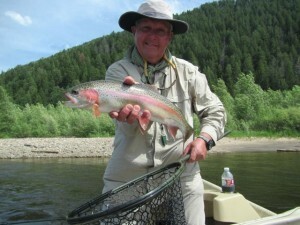 We would be happy to help you get set up with Yampa Valley Anglers. Check out all the photos of the trip in the “Gallery” section of the website.